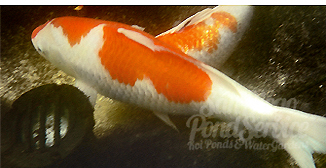 KOI CARE: Koi enthusiasts, fish hobbyists, and pond owners take immense pride in their koi fish. The joy of watching their koi develop into a beautiful prize specimen takes hard work, special care, and not to mention, a little help from the koi's bloodline. Pending on the season, your koi's color and size will greatly benefit from regimented nourishment and balanced pond water to ensure a long and healthy life. SDPS breaksdown successful koi care into six key developmental strategies. 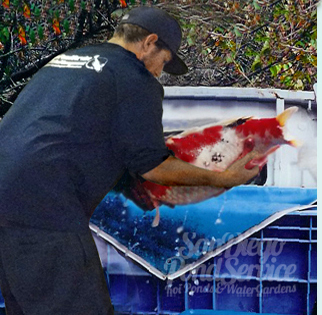 6 STEPS TO SUCCESS: Effective koi care involves maintaining a healthy underwater environment. It is important to keep your filter system operating 24hrours/day, 7days/week, and 365days/year. Without proper pond filtration, your koi could develop a loss/change in color, physical deformities, swim problems, internal parasites, and/or fatal illnesses. When establishing and maintaining a healthy, balanced pond ecosystem, San Diego Pond Service strongly recommend including these six key steps; 1) Routine/Partial Water Changes 2) Routine Biological Filter Media Washing/Rinsing 3) Effective UV Sterilization 4) Water Conditioning 5) Optimized Flow/Oxygenation Rates 6) 24/7 Filter and Pump System Operation. 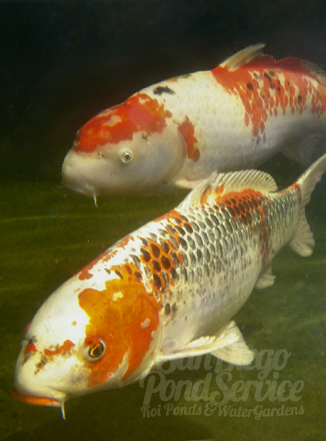 These general rules in koi care are effective during all seasons. 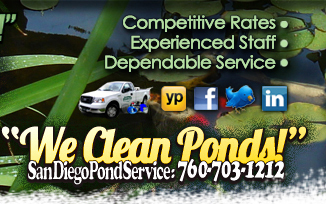 San Diego Pond Service is experienced in how to care for your koi pond year-round. SPRING KOI CARE: Varying pond water temps can wreak havoc on your koi’s immune system. When temperatures drop below 50ºF, your koi can become defenseless against harmful bacteria. Fungal and parasitic koi infections are most common during spring. After a cold winter, your koi need nutrients to build-up their immune systems. A digestible diet with Vitamin C is recommended. SUMMER KOI CARE: The growing season for your koi. Increased water temps means more koi activity. 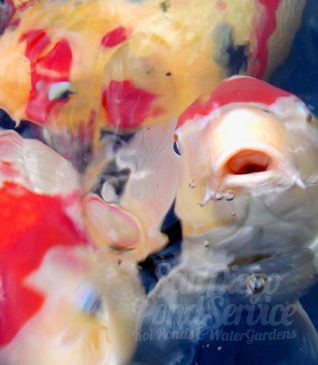 Water temps between 70º-75ºF boost your koi’s metabolism and strengthen their immune system. Feed your koi 2x daily and have adequate filtration to handle the excess waste loads. Your koi are more active in the summer, so it’s a good idea to continually test your ammonia levels. FALL KOI CARE: When the pond temps drop, so does koi activity. Keep a close eye out for parasites, as immune systems will start to deteriorate and koi become susceptible to disease and infection. It is important to avoid any extra stress on your koi, as they go through this transition towards winter. Do not over feed at this time. A wheat germ diet is highly recommended. WINTER KOI CARE: When water temps drop below 50ºF, koi slow way down. Koi fish go slightly dormant in the winter and use very little energy. It is not a good idea to attempt to feed koi during the winter season. Koi are not able to digest food in cold water. If food is ingested, it will likely rot in the koi’s stomach. This can lead to serious infections. If your pond is in a colder climate, keep pond water temps above 34ºF. It is common for koi to sit on the pond floor during winter, where the water is warmest. KOI HANDLING: Avoid any unnecessary handling of your koi fish. If you have to move or medicate your koi, do so with extreme care. Koi lose electrolytes rapidly when stressed. Stress can cause ulcers and internal bleeding. Use an appropriate sized net for the size and weight of your koi. KOI BEHAVIOR: Get to know your koi! The best way to spot an illness is by observing abnormal behavior. If your koi is sick you may see signs of irregular swimming patterns, loss of appetite, rubbing or "flashing," or visible skin lesions. Early detection and early treatment could save your koi! KOI FEEDING: Feed your koi based on the season. Use Vitamin C and protein rich foods during spring and summer. Feed wheat germ based food during fall and winter. If water temps are below 50ºF, do not feed at all. Watch your feeding amounts and be careful not to overfeed. Overfeeding your koi fish can lead to toxic ammonia & nitrites.